Hope you all had a great week end. 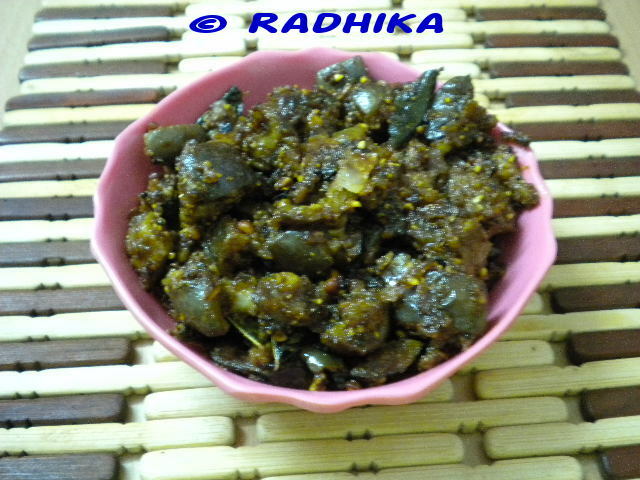 I came back with lots of brinjals and groundnuts which we all plucked out from the fields, from my hubby’s hometown and I was quite vary making the same old sambars with the brinjals when my MIL gave me this idea of combining both and coming up with a side dish. Here is the recipe…. Clean and cut brinjals into quarter pieces and immerse them in water to prevent discoloring. Chop onions finely. Crush the garlic pods. Heat oil in a kadai. Add the mustard seeds and let it pop. Then add the curry leaves, garlic. Fry for 1 min. Then add finely chopped onions. Fry till it is brown. Drain the water from the brinjals and add to the kadai. Sprinkle turmeric powder, salt, mix well and cover with lid and simmer for 5 mins. Then add the chili powder, coriander powder. 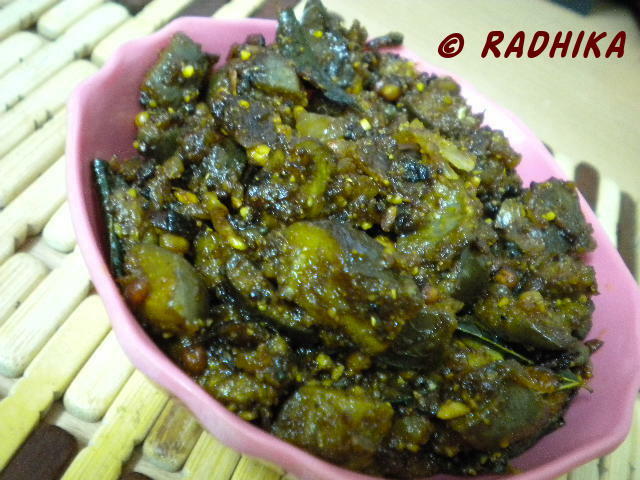 Cover and cook again for 10 – 15 mins, till the brinjal is well cooked. Once cooked, remove the lid and add the ground nut powder. Mix well and serve hot as an accompaniment with rice or chappatis. Note : Do not add water to cook the brinjals else it will become mushy. Cover with a lid and let it cook in the steam itself. I am sending this recipe to Kavita who is hosting Healing Foods: Eggplant a brainchild of Siri. This sure looks tasty Radhika… you have an exciting blog with yummy recipes…keep rocking..
1st time here..yummy recipe collection.Glad to follow you.looks yummy and delicious.. Liked the peanut twist to brinjals. Looks very nice to have with some curd rice and pickle. Delicious recipe….My mom used to cook this…She used to make it with whole brinjal and used to fill ground nut paste along with spices in it. wow every dish which u post is great !! i m not going to miss any post .! !